The Automated Negotiation Agents Competition (ANAC2012) was organized. Automated agents can alleviate some of the effort required of people during negotiations and also assist people who are less qualified in the negotiation process. 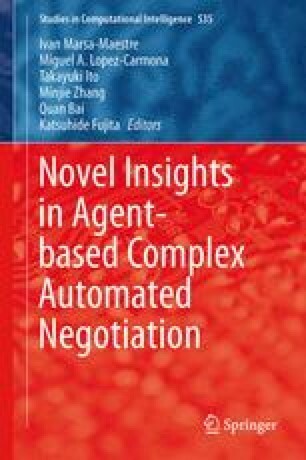 Thus, success in developing an automated agent with negotiation capabilities has great advantages and implication. In this paper, we present the strategy of the agent (Agent MR) based on the heuristic. We show the method of searching for the bid effectively and also discuss how to control concession.